For four years, registered apprentices participated in a special program to help them become licensed apprentices. They devoted their days to working as electrical apprentices, and evenings to learning in the classroom. Each student focused on the same goals: completing 576 hours of classroom training and 8,000 hours of on-the-job training. On June 10, four men reached that shared milestone as graduates of the D.C. Apprenticeship Academy. “The students who completed the program stuck with it all the way through. We are proud of their commitment and how dedicated they stayed every day,” said Beth Moore, program director for the D.C. Students Construction Trades Foundation, which hoste its sixth annual graduation ceremony at the Francis L. Cardozo Education Campus. 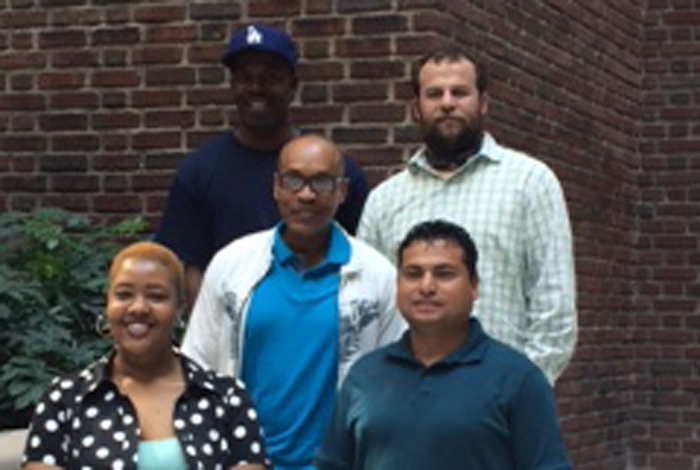 Upon completing the program, each received paperwork making him eligible to get a D.C. journeyman’s electrician license, which opens the door for new opportunities and training. The graduates can look forward to earning higher wages and jumpstarting their careers, from becoming foremen and superintendents within their companies to testing for their master electrician licenses and becoming future business owners. “It fast tracks them,” noted Moore. THE FINAL FOUR The Apprenticeship Academy Class of 2015 with staffer (far left). While this year’s class proved smaller than that of previous years (10 graduates in 2013 and nine in 2014), Moore stressed that the latest numbers do not detract from the program’s success. She said enrollment reflects the construction marketplace, which has faced economic challenges. According to the Bureau of Labor Statistics, the job outlook for electricians is linked to the economy, with demand fluctuating during construction highs and lows. “The fact that these four remained on the job shows they are high-performing apprentices,” said Moore. As in past years, parents and other family members cheered for loved ones as they walked up to accept the papers that would propel them forward on their life’s journey. But next year’s class will have a different experience. The reason: the apprenticeship academy will be relocating to IDEA Public Charter School, where the program will continue to shape the minds of future licensed electricians. The message to current graduates, said Moore, is that “hard work” and “effort” during the four years of apprenticeship pays off. These are lessons she said will pass down to future graduates, so they too will know the success awaiting them at the end of their apprenticeships.